I've touched upon my issues with my hair in the last week and how much I want to change how I see myself and take care of my hair. 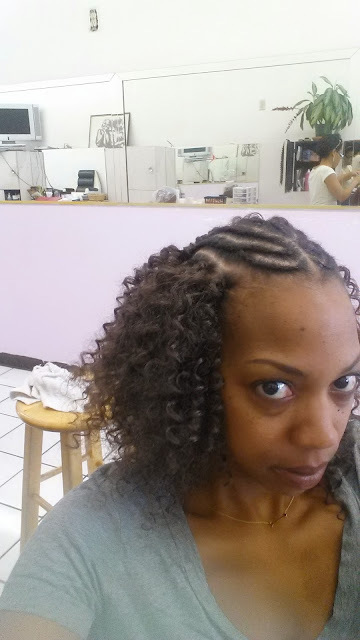 So in an effort to give my hair a break from heat and any other damage, last week I had a protective style installed by way of crochet braids. What are crochet braids you ask? Also known as interlocking braids, they are basically the best thing that's ever happened to my head. Just kidding. But not really. 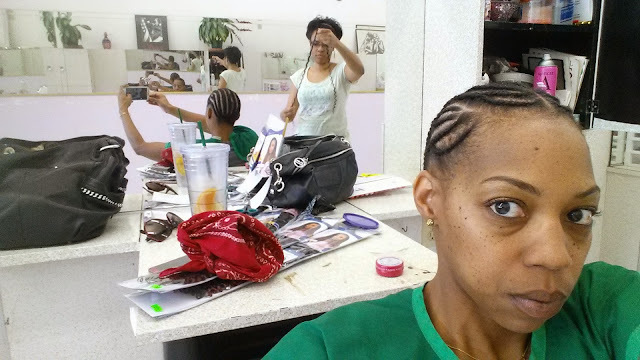 Basically she cornrowed my hair into about 8 braids mixing a few together so that I would have the option to wear it flipped to either side or parted in the middle. 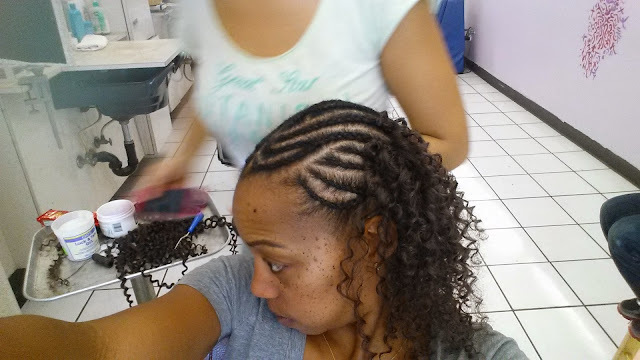 I had originally planned on using Marley hair as I loved the look in the tutorials I watched and was interested in the ability to do a twist out as well as wear it free. 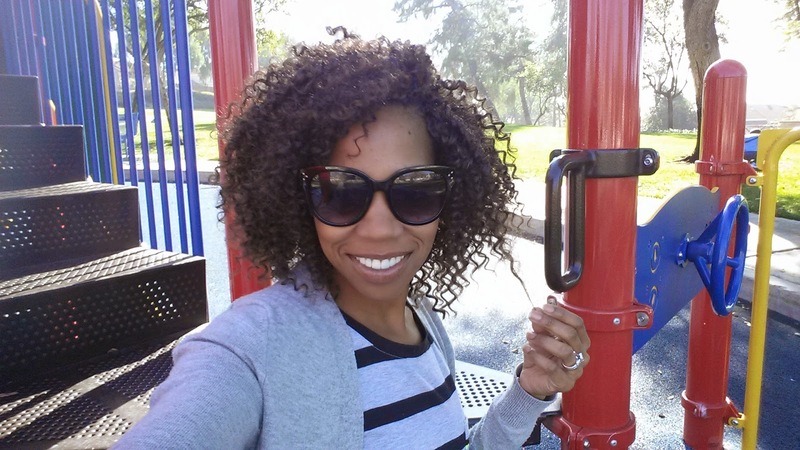 But I also loved this look on Mattieologie and when I really thought about it, I was doing this so I could spend less time thinking/dealing with my hair, so it might be in my best interest to go with hair that was a little less maintenance. But of course, that decision didn't come until after I'd already bought Marley hair. Because that's how I roll. After searching three stores the morning of my appointment I finally found the FreeTress Braid hair in Water Wave that I hoped would give me the curls I so longed for. 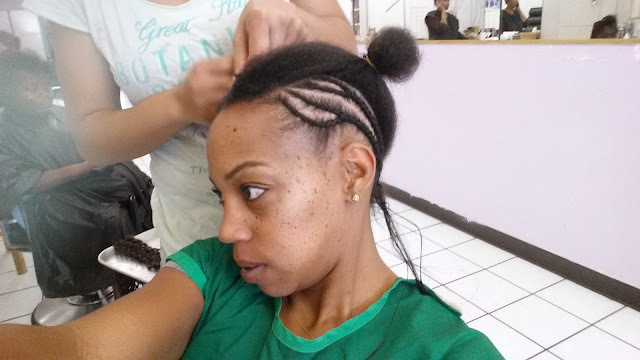 Nikea is a wicked braider, so she had my entire head cornrowed in no time and was ready to start the process of crocheting the hair through the braids. Using a tool that looks like a crochet hook she threaded the hair through the braid and looped it together in an interlocking fashion. 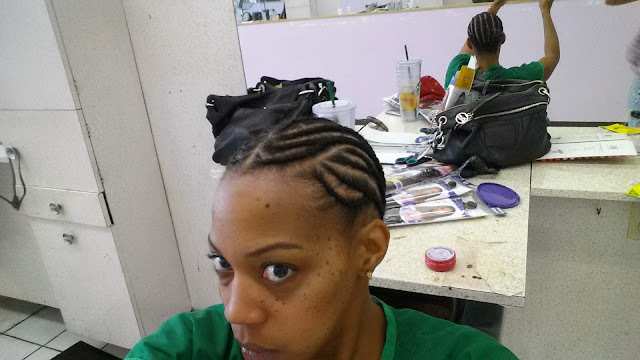 Before I knew it she had the whole back half of my head done and I was getting anxious to see the finished results and kept twisting my head this way and that to see how things were progressing. Since my hair isn't jet black I used a 4 (medium dark brown) + TP4/30 mix since I wanted a hint of color for depth around my face because hey, why not? It wasn't my hair I'd be doing damage to. We only used 2 and a quarter packs and to be honest we probably could have added more to go even bigger but I'm really happy with the results. It's big enough to stand out but not so big that it looks fake. And it looks like ME. Which is what's really important. I love that in 2015 no one really bats an eyelash (too much) when I leave the house with my hair one way and show up hours later looking like a completely different woman. Such a refreshing change from how protective styles used to be viewed. Unfortunately it was a Wednesday evening and I was whooped by the time we were finished and all I wanted was to eat some chips + salsa for dinner and catch up on work. 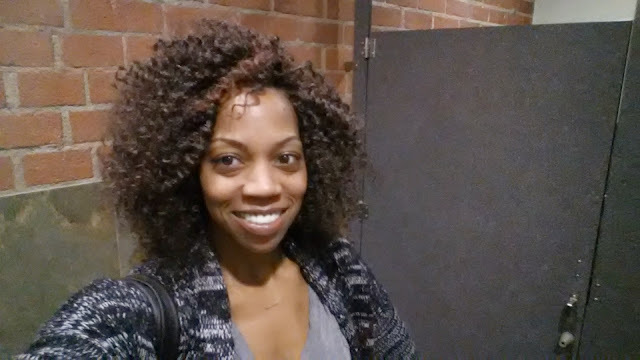 But of course I had to snap a quick bathroom selfie once it was totally done. And then another when I got home. To be honest, when I took the photos in the bathroom I was really trying to get used to it. I was super paranoid that it was just TOO BIG and TOO DIFFERENT from my usual look and that everyone was looking at me. And while they may have been looking at me (I wasn't in the most ethnically diverse neighborhood) I simply decided it's because my hair was SO fabulous they couldn't help but stare. Yes, it seems the quip my girlfriend text me the day before "the bigger the hair, the harder they stare" seemed to be coming true. I spent the majority of the rest of the evening staring at myself in the mirror trying to wrap my head around the reflection I saw looking back at me and figuring out how to best style my new coif. I've taken no less than 20 selfies in the last few days in an effort to really gauge how my new hair really looked (with my many faces) and to just sort of get used to myself as a girl with "big hair". I've had hair envy since college when my freshman roommate used to wear her hair 'out' and it was my first time being friends with someone who wore their hair like that and I was so intrigued and mystified by it. I secretly wanted that same type of hair (and the looks that came with it) for myself although I told myself that I was happy with my freshly permed highlighted locks. Finally I get to see for myself what it's like to be the girl with 'big hair'. The next night, Thursday, I had plans to attend a party in honor of John Legend for Grammy week, hosted by L.A. 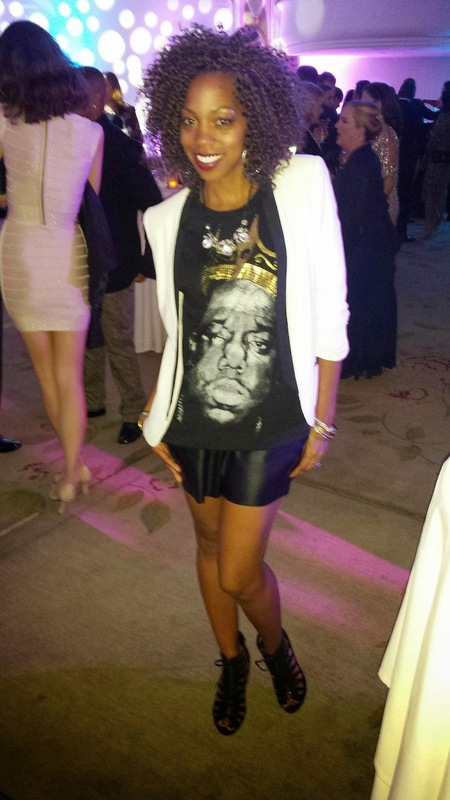 Confidential magazine at the swanky Beverly Hills Hotel and I was stupid excited to take my new hair out on the town! When I picked up my plus one for the evening, my sister-in-love, the first thing she said was "I like your hair! It's so big!" Totally put me at ease as for some reason I was getting anxiety about my new look. Every time I do something drastic to my hair, even if I'm excited about it, I still have major anxiety and enjoy receiving confirmation that my 'do is indeed 'on fleek'. As the week has progressed, I've realized that while I do love the look, I'm still getting used to it. But I'm happy to report that everyone else absolutely loves it as well. When I walked in the door the first night D said "Ooooooh." and Baby Ninja said, " I yike your haircut mommy". Sweet Pea digs it as well. I'm having fun with playing around with the different ways I can wear it and fluffing it up at every opportunity. I keep catching my husband looking at me and he was happy to tell me how much he's enjoying my new look. Poor guy, he never knows who's going to walk in the door whenever I go to the salon! I'm so happy with this look and I have to thank Nikea of New Image Salon in Long Beach for hooking me up with the fresh locks! What do you think of my new do? 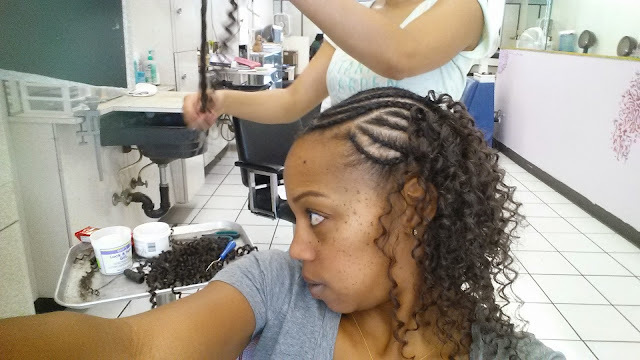 Have you ever heard of crochet braids? Would you try it? I love it! You look fantastic! It looks gorgeous! I want mine done!!!! So fun and looks great! it looks beautiful! I love it! It's so cute and I love your out that you wore to the John Legend event. I love it, I'm in a hair slump right now and need something to take me out of it. I don't know what it will be as of yet. Your hair is big but not odd big and I love the girls, it looks natural and that's the best part. You are owning it. I love it! I want to do something new with my hair as well, but I'm stumped at the moment. This may be the perfect protective style for me while I grow the back of my hair out.